Pacheco State Park could not be counted among the well-known mountain biking destinations in the Bay Area. I imagine this is mostly due to its remote location. It's actually only incrementally farther away than Henry Coe State Park, and I wouldn't be surprised if the driving time to Pacheco were comparable to that to Coe, because you drive to Pacheco via a fairly fast divided highway, in contrast to the winding mountain roads you take to Coe. One reason Pacheco State Park may qualify as an under-utilized gem is that the park brochure mentions there are 28 miles of trails in the park and all of the trails are open to bikes. By a rough eyeballing of the park map, roughly about two thirds of the trails are singletrack. Granted, some of these "singletrack" segments are little more than barely visible lines across a meadow and some spots are fairly treacherous with a steeply falling slope on one side and a narrow, crumbly, and off-camber trail surface. In fact, that last point could be enough to make Pacheco a bad choice for inexperienced riders. Meanwhile, the fire roads in the park seem to spend half their time in short and steep climbs and descents. I wouldn't exactly rate navigating the trails at Pacheco as "easy". I did notice that some trail junctions had signs, but there were also some that didn't. And sometimes the difficulty arises from asking yourself whether what you're on really is a legitimate trail because it's so faint or overgrown, and you're tempted to veer off in a direction that looks more promising. Thankfully many of these underused segments are accompanied by occasional trail signs. While these say nothing more than "Trail", they at least reassure you that you're still on one. The landscape isn't too rich in visual reference points either (like a coastline or a prominent mountain range) by which to orient yourself. So, on your first time here, unless you're accompanied by someone who has done the ride before, I would suggest careful attention to following your progress on a good map. (The downloadable park maps may not do it. I'd suggest a prinout of the topographic map linked on your left.) Naturally, carrying with you a mapping GPS receiver on which the route of the ride is plotted would be the best. Being a state park, parking at Pacheco is subject to a "day use" fee. As of this writing, this fee is $5. There is no attendant to collect this, so you'll have to place it in an envelope and drop it in a slot. This means that it would be a good idea to bring exact change with you as well as a pen to put your license plate number on the payment envelope. Keep in mind that the park is just a hop and a skip away from the Central Valley. So, expect it to be very hot in the summer. Neglecting to bring extra water with you on a summer ride here could be a recipe for disaster. (There is water available at the parking lot but a sign warns that it's non-potable.) Tree cover is almost non-existent; the only shade you get is the partial shade that one of the oak trees sprinkled across the terrain here will provide when it happens to be near the trail. On the other hand, that same oak-sprinkled grassy countryside is bound to look gorgeous if you happen to ride here between January and April when the grass is green, as you can see in the photos that accompany the ride description at The Ogre's Hut. On this ride, I was attempting to replicate the most common ride route people seem to take at Pacheco, judging by the GPS tracks I've found on the net. Essentially, this consists of the widest clockwise loop you can trace in the park's trail system. In the end, though, my riding buddies and I decided to follow a shorter route back to the parking lot on this ride after we reached Diamond Lake, because we were running short on time and getting our butts handed to us due to the heat. 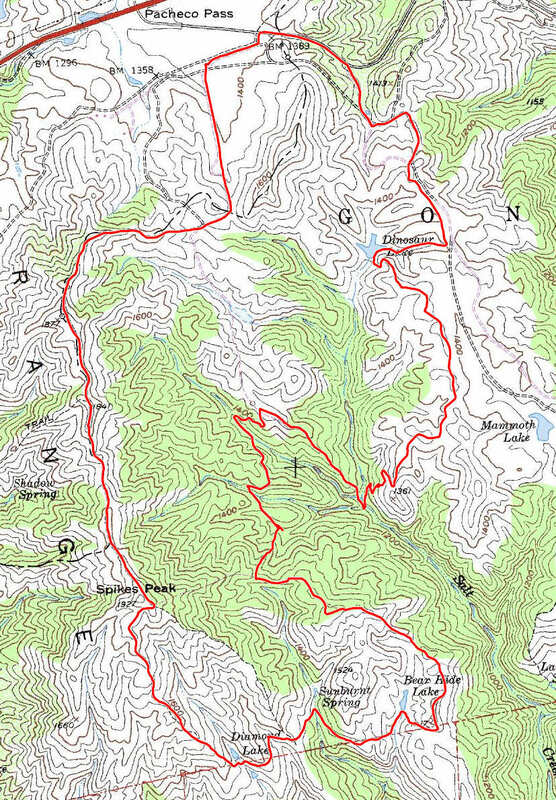 For your information, a more complete "typical route" at Pacheco would have continued along the rest of South Boundary Loop and taken Shadow Spring Ridge Trail after Spikes Peak to follow Whiskey Flat Trail (not Whiskey Flat Road) back to the parking lot. You can find other downloadable GPS tracks on sites like Garmin Connect that reflect this complete loop. In the end, Pacheco State Park is not exactly a contender for one of the best mountain biking destinations near the Bay Area. But, if you're a seasoned rider who has already exhausted the more popular ride options around us, you'd be missing out if you don't try this park once.